This game takes inspiration from the great air races of circa 1908 to 1913 which took place in the pioneering era of air travel. These air races galvanized interest across the world and encouraged by generous prizes by newspapers and other sponsors attracted international entries. Air travel was risky and most unreliable. Often only a small number of the entrants would make it to the finish line. Will one of your pilots manage to face up to the challenge? But watch out: In this era of gentlemanly behavior and stiff upper lips, there are a few cads and bounders who will cheat to win. 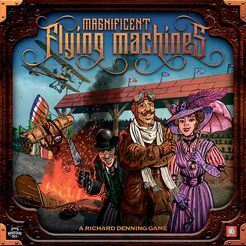 In Magnificent Flying Machines, the player who ends the game with the most victory points wins. These can be earned in various ways including being the first to land successfully on a certain terrain tile, landing on the middle airfield, transporting cargo or passengers, or performing trick maneuvers. Simply being the first to cross the finishing line is unlikely to be enough on its own to secure a victory. The winner will be the player who picks a strategy that best matches the abilities of the pilot and features of the flying machine they are using. The game is played in a series of rounds. A round begins with the first player taking a turn. Each player takes their turn in order clockwise around the table. During a turn a player has two action phases available. There are three types of action phase to choose from. These are the takeoff phase (which may also include refueling, repairing and scavenging spare parts), the flying phase (which may also include gaining altitude and performing trick maneuvers), and the landing phase (which may also include refueling). In addition, whenever a flying machine lands on a terrain tile any passengers that wish to will disembark, and any cargo intended for that terrain type is unloaded. It may also take on available equipment, cargo and passengers if space is available to do so. Players progress in the game by passing a series of takeoff, flying and landing tests. To determine the difficulty of a particular test, first look at the number of symbols for that test shown on the terrain tile that the flying machine is on. Simply add the number of symbols shown on the terrain tile to the number of symbols on the relevant weather tile. If a player needs to take a test, first check to see the total number of relevant symbols shown on the flying machine dashboard. This is the number of dice that may be rolled when attempting to obtain a sufficient number of symbols to pass the test. If the player does not roll enough symbols they may then choose to make use of special equipment, use spare parts, or play trick and boost cards to obtain additional symbols in order to pass the test. If a player is unable to obtain a sufficient number of symbols to pass the test then a failure occurs. If the dice rolled include a catastrophic failure symbol, then a catastrophic failure occurs. The effects of such a failure vary depending on the test being taken.